How do I fill my Sinchies? How do I clean my Sinchies? How do I dry my Sinchies? What can I put in my Sinchies? How long do Sinchies last? The most important reason why you should choose Sinchies over other brands is because all our pouches are transparent. This is the most important thing when choosing pouches! You need to be able to see inside them. Why? Firstly and most importantly, you need to see if they are clean. If you have a coloured pouch you can’t see if there are any bits stuck inside them and risk contaminating the food. Secondly, having a clear pouch allows you to see the contents to ensure it’s fresh! And last of all – we don’t try to cover up any faults that may arise. If there is a defect with the product you will be able to see it and let us know. Please wash or sterilise your Sinchies reusable food pouches before filling them. Sinchies pouches are safe to use in the freezer. Cook in large batches, fill your pouches all at once and refrigerate or freeze them until needed. We recommend heating the contents of your Sinchies the old fashioned way, in a jug of hot water. Here at Sinchies we don’t recommend putting any plastic products in the microwave. However if you choose to heat your food this way, we recommend using a medium temperature and giving them a shake around every 15 seconds so as not to create hot spots. Please note that using the microwave will reduce the life of your pouches. All our spout pouches come with standard lids. We encourage you to buy child safe (choke free) lids If using this product for babies and infants. Standard spare lids are also available for purchase. Our 80ml pouch size is similar in size to pre-filled yoghurt squeezies found in the supermarket. These are a great lunchbox size and are also perfect for international flights with 100ml liquid restrictions! Or use them to store energy gels or gu’s when going on a hike, bike ride or competing in a triathalon. Our 140ml pouch size is similar in size to pre-filled baby food pouches. These are our ultimate size for baby food puree but are also a great lunchbox size for older children. Use these to serve and store purees, yoghurt, custard, jelly, yogo, smoothies and other things like salad dressing or even toiletries! These pouches are very handy for handbag or baby bag sized sunblock. Our 200ml reusable pouch size is the perfect size for older children, parents, grandparents or littlies who have a healthy appetite. Use these ones to serve and store many a thing like purees, yoghurt, custard, yogo, smoothies, sauces, soups, leftovers and other things like salad dressing, toiletries or even washing liquid. You don’t have to fill them up all the way. With the 500ml, you can make and store your own soup, stock, broth, juices, milks, cocktails and marinades at home, saving space in the fridge and freezer! 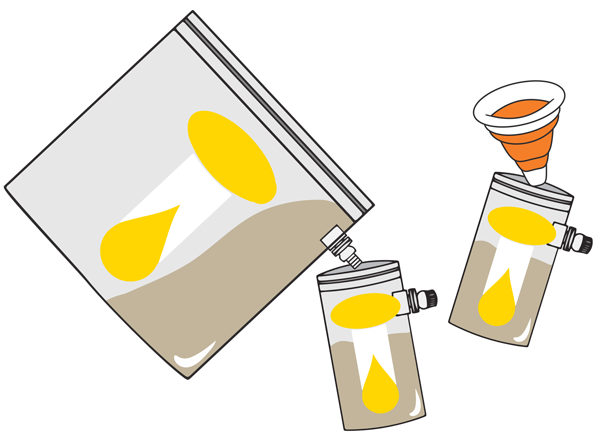 The 1 litre pouches are our ultimate filling tool or accessory, great to fill your other pouches with. Or ready to fill these with your favorite, healthy home cooking! Use them for storing bulk amounts of yoghurt, soups, stocks, juices, milks and lots more. 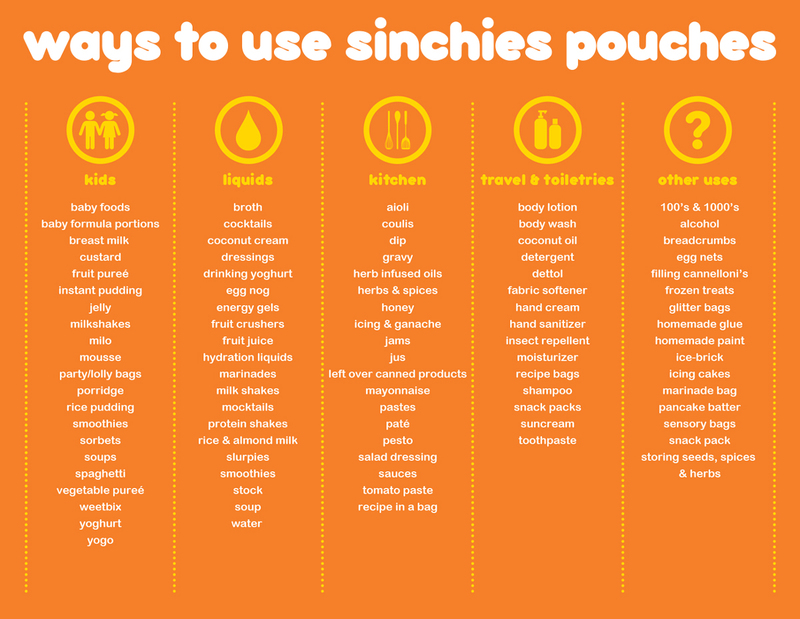 Sinchies Pops are the ultimate reusable ice block pouch! Simply fill, seal and freeze. Once frozen simply rinse, pop and eat! These pouches are a similar size to ice lollies and catch the drips on super hot days. The latest additions to our Sinchies range are the Sinchies reusable Snack Bags, Sandwich Bags and Australia’s first ever reusable Wrap Bags. These pouches are designed to replace the mountains of disposable zip lock bags and cling-film that is used, and to support schools and daycare centres with teaching our children about sustainability. Ensure the lid is tightly fastened and you’re ready to go! Open the pouch’s ziplock and expand the bottom gusset (on side spout pouches) so it can stand up, making it easier to fill. Use a 1 litre Sinchies reusable food pouch, funnel or other accessory to fill your Sinchies pouch. Continue pouring your scrumptious food up to the ‘fill to here’ line on the pouch. When sealing the ziplock, widen the bottom gusset with two fingers to help ensure your contents doesn’t spill out the top. From Missy – Easy way to fill Sinchies, use a sauce bottle! Today they have vanilla yoghurt in 🙂 No mess! From several mums – Cut a plastic water/soft drink bottle to make a funnel. Makes it SO easy! From Sarah – When filling a lot of them I have been using a piping bag!! Makes it way easy and hardly any mess! From Sheree – I purée fruit in a Pyrex measuring jug (with a “pour lip”) and pour it in…slowly! From Jacqueline – I use a funnel. It works a treat! From Kendell – Cake decorating cylinder. The easiest way to clean them is by using one of our cleaning brushes. Support the bottom of the pouch with your hand and use a twisting motion so the brush gets right down to the bottom of the pouch. Our cleaning brushes come with a smaller brush (at the bottom) to clean the spout and seal. From Kirsty: I sterilize. Wash them out with warm soap water. Pop them in a microwave sterilizer for 5 mins (I have a 950w) and they’re fine. I will also get some Milton and use both methods, I’m sure Milton will be gentler. From Emma: I use a bottle brush here and pop them upside down in a cup of spoons to dry (or end of the bottle brush if only one). From Rebecca: Bottle brush for the pouch and the bottle teat brush for the spout. From Ashleigh: If there’s yoghurt dried in there from being in the lunchbox all day I rinse it under the tap with a drop of dishwashing liquid, and rub the sides together. From Sarah: I rinse them through the spout, then clean them with a tupperware small bottle brush. From Alison: As I tend to have 10+ going at once (5 kids!!) a bit of warm water and detergent, pop the lid back on and give a little shake. To dry them, I put a scrunched up piece of paper towel inside and leave them upside down on the drying rack. Otherwise they get smelly if they don’t dry properly and mine often get left in lunch boxes with yoghurt remnants inside. From Cassandra: Bottle brush, then into the sterilizing bucket, rinsed then semi dried, then into the fridge until filled. We love’em! From Kerry: I just use a cloth on the end of a butter knife if there are any stubborn bits stuck down the bottom. Sinchies have no control over consumer’s effective food hygiene practices and will therefore not be held responsible for any issue, health or otherwise, that may arise due to the consumer’s choice to reuse pouches. We wouldn’t continue selling these as reusable pouches if you couldn’t clean them properly! 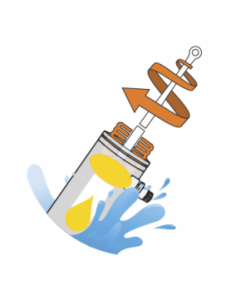 If you have tried the above tips but are still having trouble getting them clean, please email us at sendmesome@sinchies.com and we’ll be happy to help! Fold the side seals together (so the bottom gusset and ziplock stay open) and pop them over the prongs in your dish rack. Get a short glass and some spoons or chopsticks. 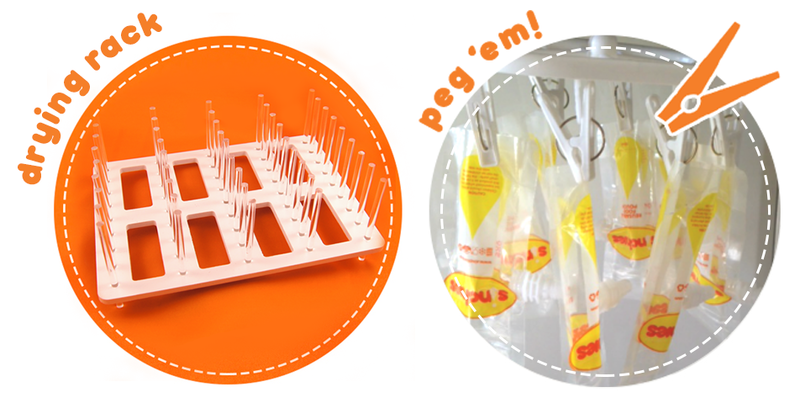 Place the utensils in the glass, pop each Sinchies pouch over one and they’ll dry in no time! Use a round peg hanger – see picture below. Or once they’ve been washed given them a shake and place them in the freezer. From Ali: Use magnets and hang them on your range hood. From Claire: I dry mine by sticking them over the handle of the potato masher to keep them open. From Elly: I leave mine to dry on the bottle dryer (prongs), then store them in fridge or freezer. We can’t say exactly how long Sinchies last as everyone uses them for different things and take care of them in different ways. We have had some customers using the same batch for years and some only for six months as they’ve constantly been heating the pouches, freezing them and washing them in the dishwasher (please note, we do not recommend putting pouches through the dishwasher). Generally we say six months is a good life, due to the low price point of the pouches ranging from $1 to a few dollars. Prolonged use of the dishwasher and freezer will reduce the life of your pouches. available on purchases over $60! VOTE TO WIN $100 worth of Sinchies goodies!